Adam Hamilton is the only one I’ve read who explains this dynamic. He explains it in a very good article here. 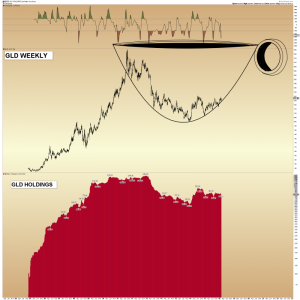 The Price of Gold is determined primarily by US Stock market demand for GLD shares. That’s really all we need to know as a takeaway from this article. It is a great product, plenty of liquidity in product and options. As a trader I would choose GLD. Do you really own the gold? No. If you are a bank, maybe you can take physical possession, not an individual. There are many issues with it if you really want to own physical. Although I own small amounts of physical gold and silver now, I personally never want to deal with the irritation and costs of managing a large amount again. I’ve also used Goldmoney and still have an account there, is a cool product but eats you alive with its transaction costs. I’ve used Perth Mint certificate program and that is fine over long periods of time, but with in an etf world it’s not necessary. Apparently they are starting an etf. If I really wanted physical gold or silver I would buy PHYS, CEF, or PSLV. These products have good liquidity and at some level an individual can take possession. This turned into a rant, hehe. I enjoyed this post but prefer Graddhy’s, Northstar’s any many others here at the Tent’s takes on where we’re going. This article is interesting but not entirely satisfying.